IITA-Cameroon was very active and visible at the recently organized exhibition day of the Center for Scientific Research and Innovations (JERSIC) in Ebolowa, Cameroon. The event, which was held on 28-29 June, was organized by the Regional Delegation of the Ministry of Scientific Research and Innovations and was chaired by the South Region Governor, Felix Nguele Nguele. The governor and his team view the IITA stand. IITA scientist, Apollin Fotso Kuate, welcomed the Governor Nguele to the IITA stand. Fotso gave a brief presentation of the ongoing research at IITA-Cameroon as well as results obtained. He emphasized on the new cassava varieties released by IITA to boost cassava production in Cameroon in the framework of the Agriculture Investment and Market Development Project (PIDMA) as well as the biofortified cassava under multiplication. He also gave explanations on the in vitro process of producing healthy suckers of banana and plantain. 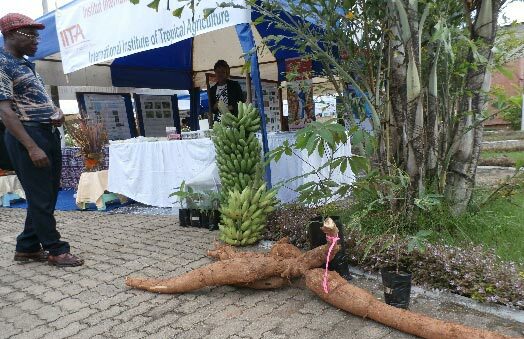 Agricultural produce displayed at the IITA stand. 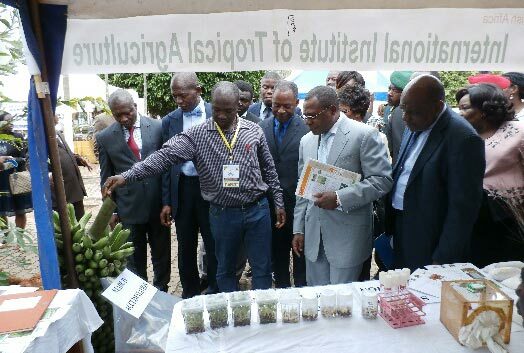 The governor and his team was impressed at what they saw and learned at the IITA-Cameroon exhibition stand, and encouraged the staff present there to continue disseminating the institute’s research findings for the betterment of Cameroonian farmers. The IITA-Cameroon exhibition stand received more than a hundred visitors, with staff responding to various queries about the products on display as well as research work being conducted by the institute. Visitors included farmers, students from the different agri-schools, agricultural researchers and consultants, businesspersons, and representatives of farmer organizations. Most the visitors expressed interest in obtaining planting materials of improved varieties of crops being worked on by IITA. They were also informed about the Banana Bunchy Top disease that occurs in the region. Handouts of various activities were distributed to visitors.